A few weeks ago I started writing about the origin of the word blurb, but ended up writing instead about tintiddle, also known as l’esprit de l’escalier. In this post I’ll finish what I started. 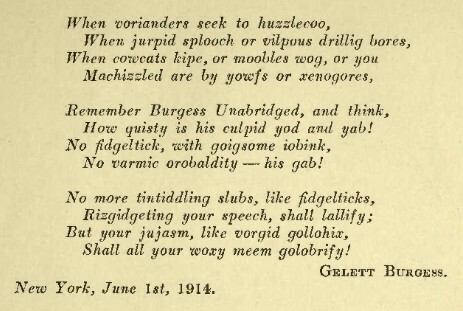 Gelett Burgess (1866–1951) coined both blurb and tintiddle, though blurb is sometimes attributed to Brander Matthews. Matthews set the record straight in a 1922 article (PDF) in the New York Times, in which he also describes the art of the blurb. The story began at the 1907 American Booksellers Association banquet, where Burgess handed out copies of his new book Are You A Bromide? The book had a parodic jacket with a photo of a woman who effusively praised the book and its author. 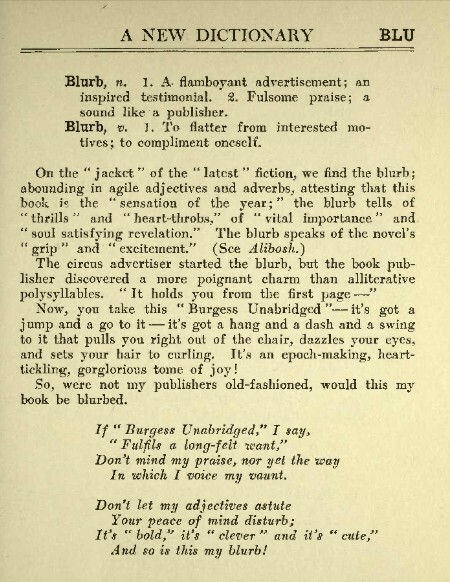 Burgess had borrowed the image from a dental advertisement and had given its subject a new name, Miss Belinda Blurb, and a new role: blurbing. The word quickly became popular and remains so today. The Oxford English Dictionary defines blurb as “a short promotional description of a book, film, or other product”. Some dictionaries, e.g. Merriam-Webster, include blurb as a verb: “to describe or praise in a blurb”. Blurb, v. 1. To flatter from interested motives; to compliment oneself. Here is a photograph of Burgess at work and at play – to his credit, he seems to have combined these activities throughout his career. He was well known for his humorous drawings and writings, including children’s books, comic strips, and poetry – such as a parody of the Rubaiyat of Omar Khayyam. His short verse “The Purple Cow” became so popular that Burgess wrote a sequel threatening to kill anyone who recited it! The poem also inspired rewrites in the styles of other poets. Although his writing amused and entertained, it could also edify: an example is “The Wild Men of Paris”, his fascinating essay on Cubism. We have no Academy, thank Heaven, to tell what is real English and what isn’t. Our Grand Jury is that ubiquitous person, Usage, and we keep him pretty busy at his job. He’s a Progressive and what he likes, he’ll have, in spite of lexicographers, college professors and authors of “His Complete Works.” That’s the reason why English has ousted Volapük and Esperanto as a world language. It snuggles right down where you live and makes itself at home. How does English shape itself so comfortably to the body of our thought? With a new wrinkle here and a little more breadth there, with fancy trimmings, new styles, fresh materials and a genius for adapting itself to all sorts of wear. Everybody is working at it, tailoring it, fitting it, decorating it. There is no person so humble but that he can suggest an improvement that may easily become the reigning mode. This entry was posted on Tuesday, April 14th, 2009 at 4:07 pm and is filed under books, etymology, words. You can follow any responses to this entry through the RSS 2.0 feed. You can leave a response, or trackback from your own site. Brilliant stuff! I’m stunned that there isn’t a band (or a blog) called The Proud Purple Penultimate. 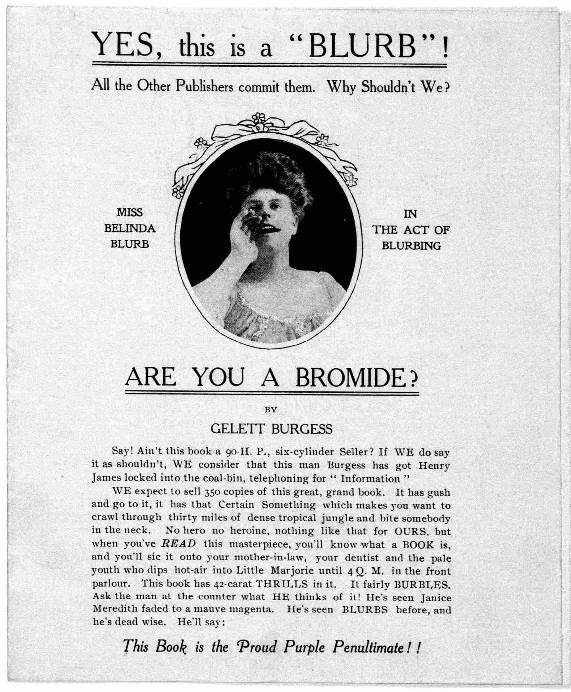 In fact, I’d use it myself if I wasn’t already Doubtful (and “Are You A Bromide?” provides an excellent subtitle). Doubtful: He certainly had a great way with words – as did his namesake Anthony. The Proud Purple Penultimate reminds me of the Exploding Plastic Inevitable, though I think I prefer the PPP! I am so glad that I did tell that spontaneously I felt a bit reminded of ‘Dada’, but surfed to the Poemhunters and read some of his poems. Interesting word acrobat, indeed, but certainly easier to appreciate for native speakers. Tout ça c’est du baratin (overwhelming blah blah blah)to convince us, that with an additional syllable turned upside down, the English language is much richer, and much more appropriate to today’s life. It’s amusing but not very adoptable, except a word here and there. Actually, for many years, we have done this to the French language in Quebec, sans tambour ni trompette. When the French come to snub us, to confuse them, we switch to “joual” or “franglais”. Both are very complex and fun languages which might never become internationally known but will never disappear from our little corner of the world. And, with the proliferation of the internet, new expressions are added everyday to the vocabulary. Possibly, I might have missed totally what Mr.Burgess is talking about. As the only ambition of my English life is to understand Shakespeare, I’ll continue in that direction, and forget about Golobrifaction. Mostly because it doesn’t do much for the satisfaction of my snobbish soul! Sean: Burgess’s word creation allowed him to experiment and play, activities manifested also by Dada, but Burgess was breezy and whimsical, whereas Dada was serious and revolutionary (behind its absurdist exterior). Or was it something else that reminded you of Dada? Claudia: “amusing but not very adoptable” is a fair description of most neologisms, though Shakespeare had better luck than Burgess in that regard. With very few exceptions (e.g. blurb), Burgess’s “imaginotions” did not take root, and retain only curiosity and amusement value. I read about joual after you mentioned it: very interesting! I wonder how it sounds to an orthodox French speaker. RE: French joual. Unless you grew up French, in Quebec, it’s very difficult to understand that language. Also each region in Canada has different expressions; it adds to the confusion. My grandfather(a fisherman, from Gaspé) could not read and write. He would say: moé pour moi, toé pour toi,timber pour tomber, douce-que-tu viens pour d’où viens-tu, pantoute pour pas du tout…I was 4 when he came to stay with us, and I became an expert interpretor for him. Some of our Quebec writers have written fiction letting the people in the books speak exactly like non-educated French-Canadians. They have been very successful, even winning literary prizes. When my son took French at the University level, he complained to me that he could not understand the people on the streets, and in the stores. I asked him for which reasons he was learning French, and where was he going to live for the rest of his life. Either one buries oneself in perfect books, or one mixes with imperfect people. It’s not that difficult once you get used to it. I can speak all kinds of French: regular, patois, joual, franglais… even Parisian French. I just adapt to my environment. Although at work, as a nurse, I spoke the educated Montreal French which is very clear, lucid, with no strong accent. It’s been fun, still is. Even more so, when I meet the French-French, and try to dazzle them or confuse them…Not much love in Quebec for France. But as Kipling would say: this is another story…. Thank you for elaborating on joual for me. I believe it. Even in so geographically small an area as Ireland, variation in dialects (both English and Irish) is considerable. It’s more usually a matter of pronunciation than prose: speakers from different regions can sometimes be almost incomprehensible to one another! In which case they tend to modulate their speech by talking slower, translating obscure phrases, using more standard terms and less novel slang, etc. All done automatically and, it appears, often unconsciously. You gave your son good advice. Growing up in the rural west, I was exposed to great richness of colloquial speech, wherein the most casual turn of phrase is given lyrical and idiosyncratic expression. This left a deep impression and continues to delight me today. I love hearing conversational Irish-English, and when I write fiction I always have a lot of fun with the dialogue! So would “blurb” be some kind of a portmanteau word mixing “blur” and “burble” with the blurber rambling on a book’s supposed merits while trying to, as it were, blur us into buying it (ie. obscure our appreciation of its merits to make us buy it)? So would “blurb” be some kind of a portmanteau word mixing “blur” and “burble” where the blurber would, as it were (through his or her ramblings on the book’s supposed merits), try to “blur us” into buying the book? jcdurbant: I couldn’t say. Maybe Burgess just liked the sound of it.